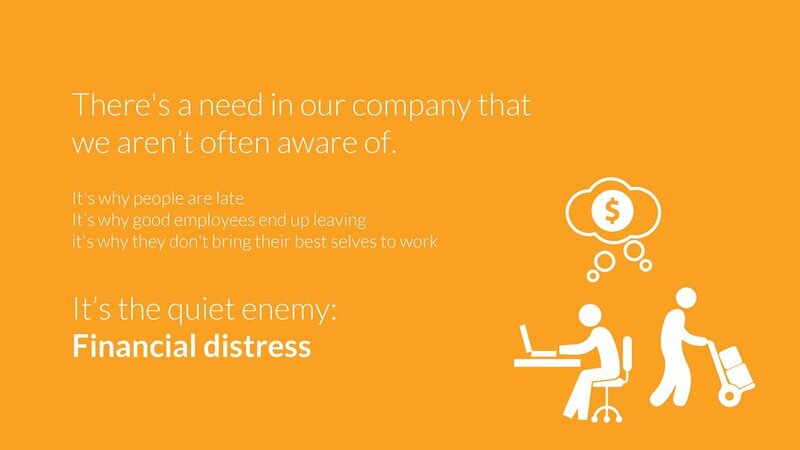 There's a reason why some of your employees show up to work late and tired, why they are distracted from their tasks, checking urgent personal texts, and ultimately leave for a job that barely pays more than you do. There is a silent enemy: financial stress. 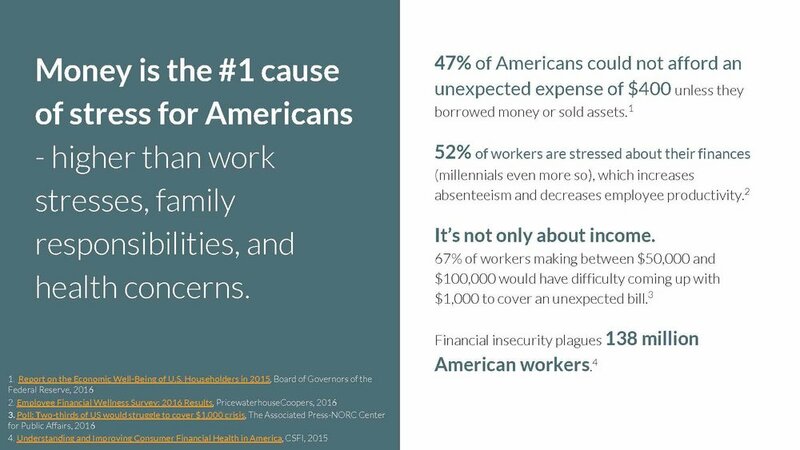 Financial insecurity plagues 138 million American Workers. Employees aren’t the only victims, either. Employee financial stress can cost your business $5,000 in productivity per employee, per year (Kiplinger). Revenues aside, financial stress is attributed to 60-80% of workplace accidents, 75-90% of health and welfare issues, and 40% of employee turnover (CSFI). What if you could alleviate that stress, improve the lives of employees, and better your business in the process? You can. 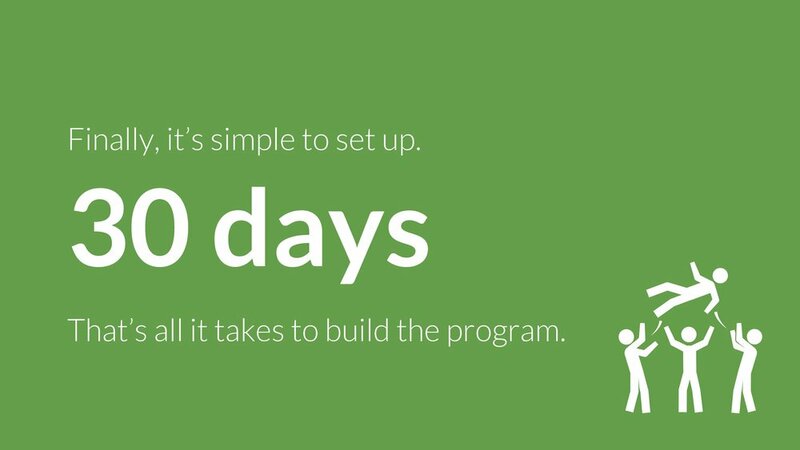 The solution is called Income Advance, and takes just 30 days to implement. Want to see our pitch? Scroll through the slideshow below. Ready to implement Income Advance? You can dive right in with our free Income Advance Guide! Want more information? Get answers to some frequently asked questions by clicking the links below. + What is Income Advance? 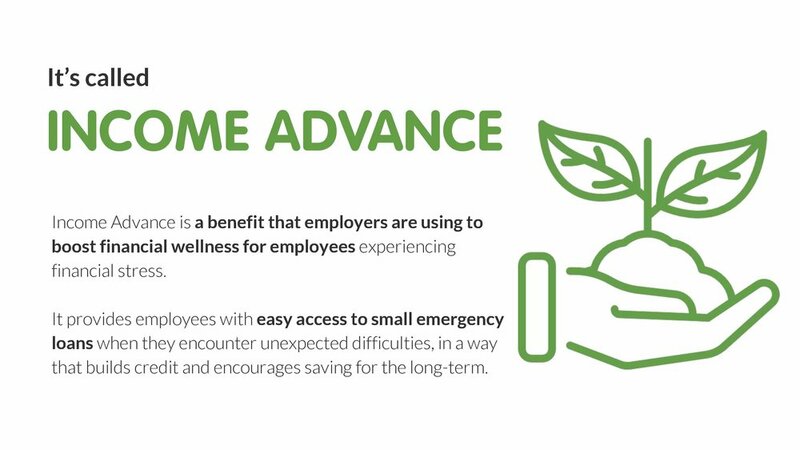 Income Advance is a benefit to boost financial wellness for employees experiencing financial instability. It provides people with easy access to small, emergency loans when they encounter unexpected difficulties, in a way that builds credit and encourages saving for the long-term. 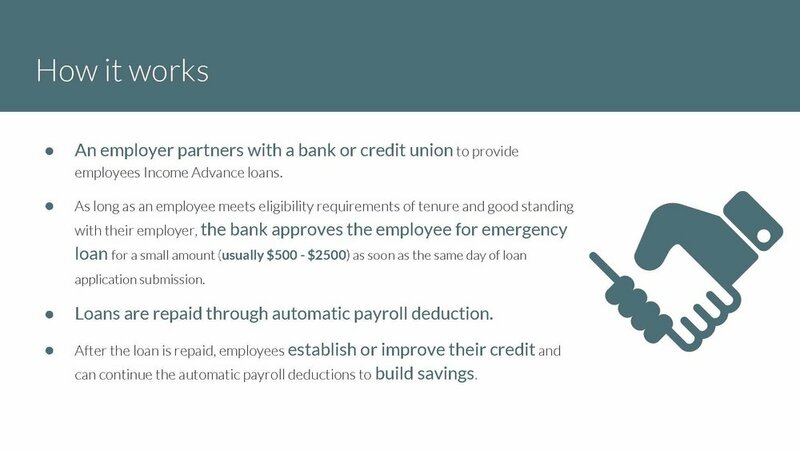 An employer partners with a bank or credit union to provide employees Income Advance loans. 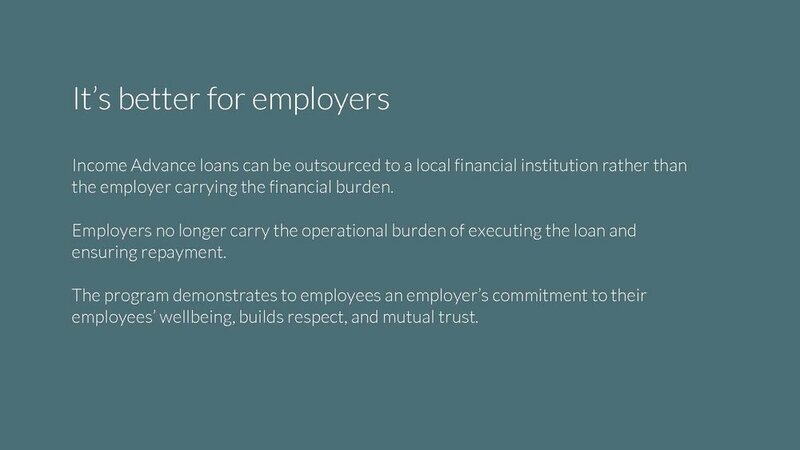 As long as an employee is in good standing with their employer, the bank approves them for a small loan (usually $1000 - $2500) as soon as the same day. Loans are repaid through automatic payroll deduction. After the loan is repaid, employees may establish or improve their credit and can continue the automatic payroll deductions to build savings. + What are the benefits of Income Advance? A 2016 Federal Reserve report revealed that 47% of Americans could not afford an unexpected expense of $400 unless they borrowed money or sold assets. According to PricewaterhouseCooper's (PwC's) 2016 Employee Financial Wellness Survey, 52% of workers overall are stressed about their finances (millennials even more so! ), which increases absenteeism and decreases employee productivity. Financial insecurity is a massive problem, and it’s costing your business. Income Advance is a win-win solution for employees and for employers. 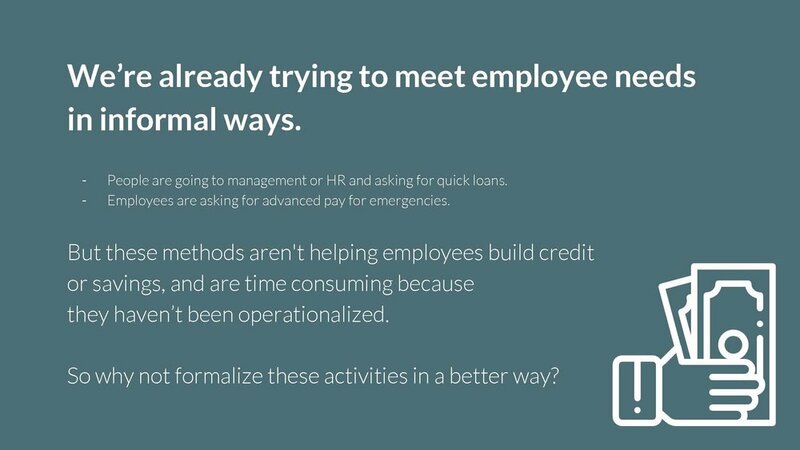 + Why should I partner with a financial institution rather than lending to my employees directly? 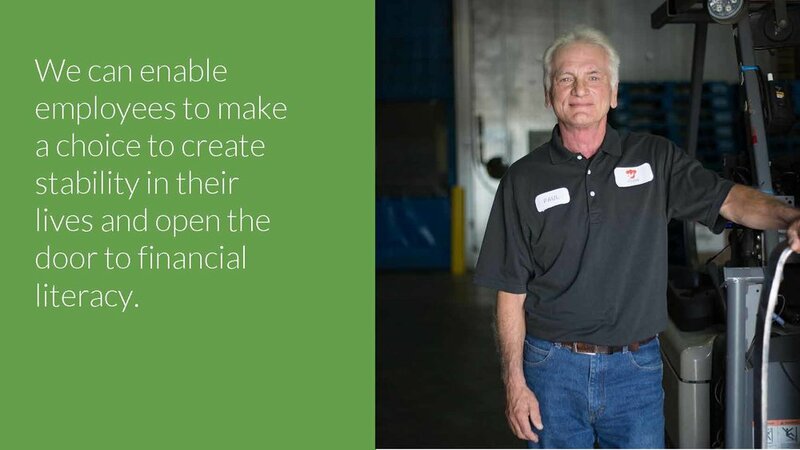 Partnering with a financial institution allows employees to access and build credit, accumulate savings, and cultivate a relationship with a bank through their loan, some for the first time. From an employer’s perspective, the partnership lifts weight off of your shoulders in terms of capacity, administrative work, and liability. 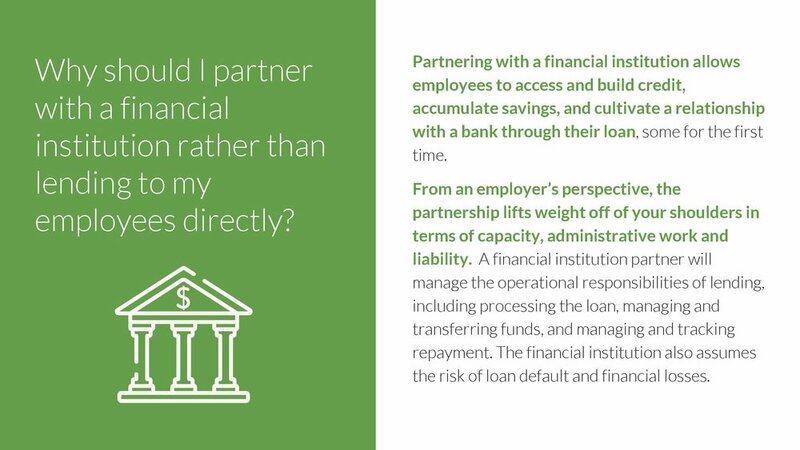 A financial institution partner will manage the operational responsibilities of lending, including processing the loan, managing and transferring funds, and managing and tracking repayment. The financial institution also assumes the risk of loan default and financial losses. + How do I find out about financial institutions in my community that offer Income Advance? You can find out if there is a financial institution in your area that offers Income Advance by contacting George Hofheimer, Chief Knowledge Officer at the Filene Research Institute at georgeh@filene.org. 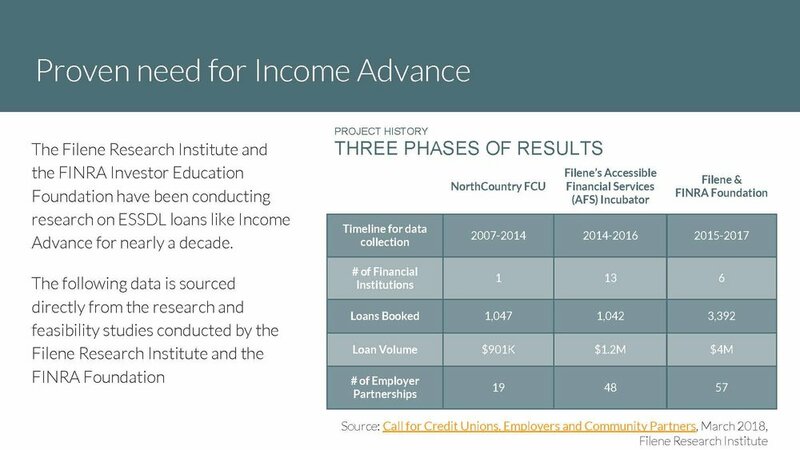 The Filene Research Institute is a non-profit organization that supports evidence-based development of credit union products and services and has championed products like Income Advance among financial institutions. + What do I do if there isn’t a financial institution offering this mechanism in my community? A) Approach a credit union or socially responsible bank that you already use, are friendly with, or you think might be mission-aligned. It’s always simpler to start the conversation from an existing relationship - so start there first if you have one. B) Work with other businesses in your geographic area to approach a financial institution together. Partnering with other employers in your area provides additional incentive for the financial institution to begin offering this new service. The Filene Research Institute can also be a resource to you if you would like help pitching a financial institution in your area. Reach out to George Hofheimer, Chief Knowledge Officer at the Filene Research Institute at georgeh@filene.org for more information. + How much time will it take to set up Income Advance? Income Advance can be set up in as little as one month! Working through the online guide will take a maximum of 1-2 hours a week. + How much will it cost my company to set up Income Advance and on a yearly basis? In general, very little! The cost will depend upon the arrangement with your financial institution partner. Many financial institutions offer the program to employers for free or charge a small fee, around $200 annually, to protect against defaulted loans. We do recommend that there is someone at your organization who coordinates setting up Income Advance. The coordinator works with multiple stakeholders in the organization, and understands the various roles to move them forward quickly through the process. This is traditionally HR or another leadership appointed individual. It should take roughly 5% of the coordinators time over the course of one month. Once the program is up and running, there should be a point person, likely in HR, who serves as the operational backbone of the program, fielding requesting and submitting applications. This should not be a significant portion of this person’s job responsibilities and should instead alleviate time formally spent issuing paychecks off schedule or internal loans. + Who at my company should take the lead to set up Income Advance? We suggest the lead be someone from HR who has employees’ trust and is familiar with the company’s payroll system. 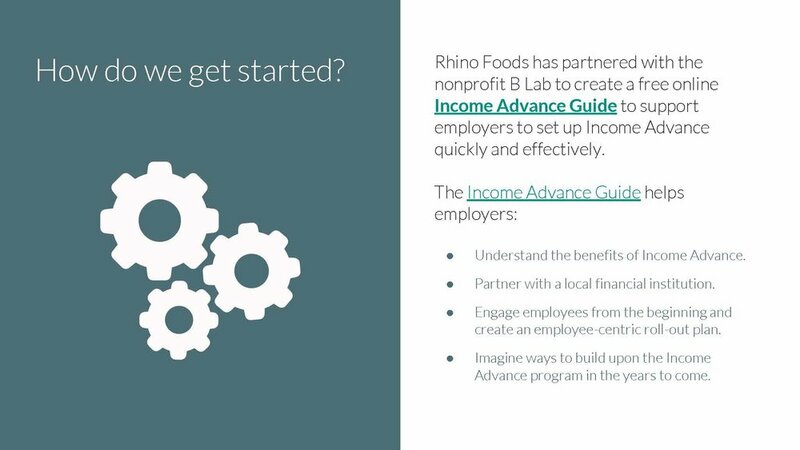 We’ve created a free Income Advance Guide to help you implement the program, which you can access at https://rhinofoods.thinkific.com/courses/income-advance-guide. Our guide is engaging, easy to understand, and allows you to choose your own path according to how you learn: take a holistic approach and go through the guide step by step, or jump ahead to specific sections you want to explore. The guide will walk you through the phases of implementing Income Advance, from engaging your stakeholders, to assembling your program, to monitoring, evaluating, and expanding Income Advance. Below is an outline of what you’ll learn in the guide. + What is the typical size and repayment term of an Income Advance loan? Income Advance loan sizes and repayment periods vary by financial institution, typically between $500-2,500 over 6-12 months. + What happens if an employee defaults on their loan? The financial institution assumes the risk of loan default and financial losses. Some financial institutions charge a small annual fee based on default rate. That said, most financial institutions will work with the employer to establish loan terms that mitigate defaults. + What refinancing options typically exist for borrowers? Refinancing options will vary by financial institution. Some will have a set policy while others may work with the employer set the policy. For example, at North Country Credit Union in Vermont, an employee must pay back at least $500 on a loan over $1,000 before they can refinance the loan. Smaller loans are taken on a case by case basis. + How does this differ with Peer2Peer Lending or other online lending options? While alternatives to payday lending options are becoming easier to access online, comparing online lending platforms can be overwhelming for even the most tech savvy and financially literate. 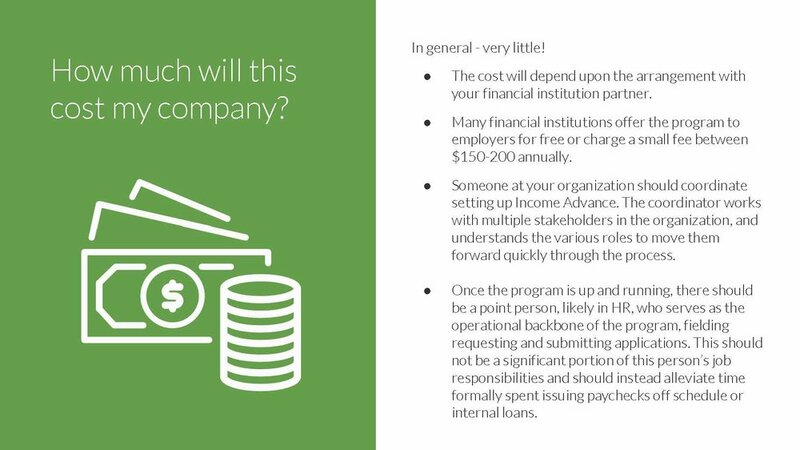 Part of the benefit of Income Advance is being able to offer a vetted alternative to payday lending with minimal stress and barriers for employees. + How do I know my employee won’t use the funds for non-emergency spending? Income Advance is about trust. 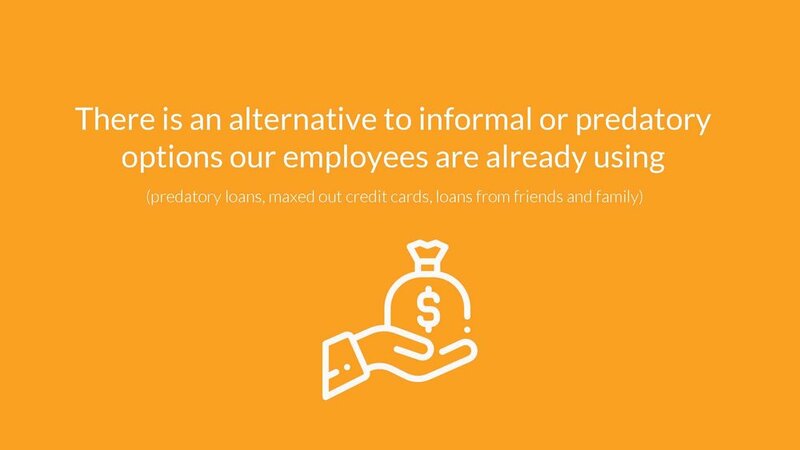 That means that there needs to be trust that employees will use Income Advance loans to support their financial wellness in ways that best serve their needs. Employees have to trust that if they come to you for help, they will have confidentiality, won’t be putting their job at risk, and will be able to count on you being on their side to support them. This means there should be no judgement placed on why an employee needs an Income Advance loan or how they will use the money. + Why are Rhino Foods and B Lab promoting this solution? 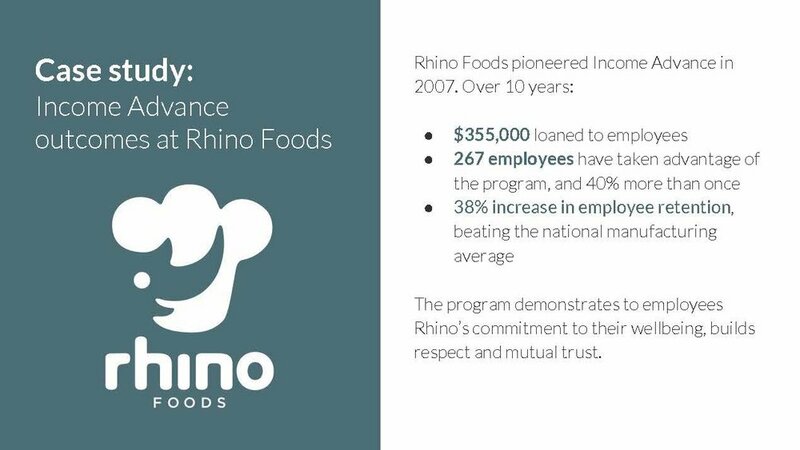 The Income Advance Guide was created by Rhino Foods and B Lab, two organizations committed to creating a shared and durable prosperity. 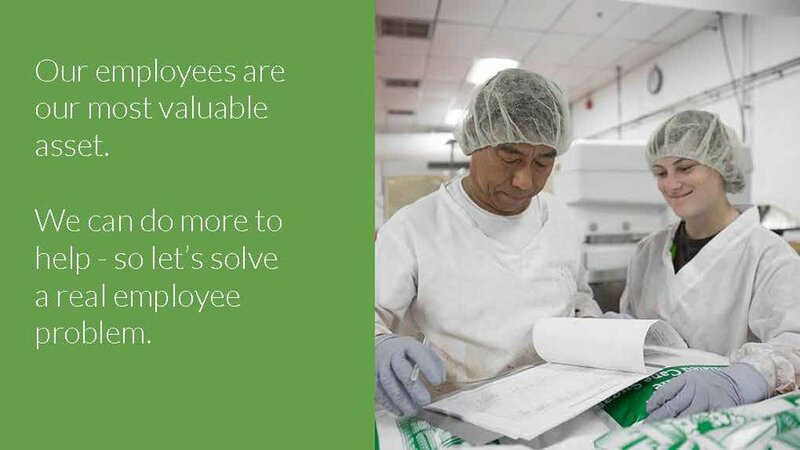 We partnered to create this guide because we believe that Income Advance has tremendous potential to improve the lives of millions of employees. You can learn more about our organizations here: https://www.incomeadvance.org/contact/.